In his new job, Hawkins will fight the state’s most important legal battles in the country’s most important courtrooms. 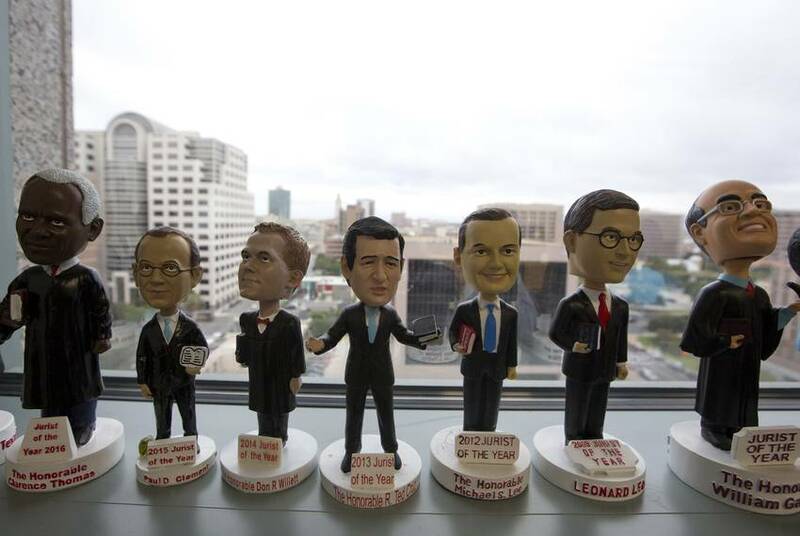 A top position in the Texas attorney general’s office changed hands this month, and with it went a row of bobbleheads. Sitting on the north windowsill in state solicitor general's office is a small army of conservative “jurists of the year,” named by the Texas Review of Law & Politics. The group includes some all stars: Clarence Thomas, considered one of the Supreme Court’s most conservative justices; Leonard Leo, the mastermind behind President Donald Trump’s transformation of the federal appeals courts; and U.S. Sen. Ted Cruz, the hardline Texas Republican who occupied this office a decade ago. Their new owner is Kyle Hawkins, who was promoted last week from assistant solicitor general to the corner office. “I inherited those [dolls] from Scott,” Hawkins says, referring to Scott Keller, the man who used to hold the solicitor general job. Also included in that inheritance: an airy new office on the 8th floor, a laundry-list docket of some of the nation’s most important lawsuits and big shoes to fill. Hawkins now leads one of the most elite units in a sprawling agency of more than 4,000 employees and more than 100 offices across the state. Established under then-Attorney General John Cornyn, and guided by the late conservative darling Greg Coleman, the solicitor general’s office has grown over the last two decades into a highly influential division carrying out the political will of a highly political state. In his new job, Hawkins will fight the state’s most important legal battles in the country’s most important courtrooms. He’ll also plant both feet on what has become perhaps the country’s best political step ladder for conservative lawyers. Cruz ascended to the U.S. Senate not long after he held the job. His successor, James Ho, is now a federal appellate judge. Jonathan Mitchell, who followed him, is a presidential nominee to lead a small federal agency. 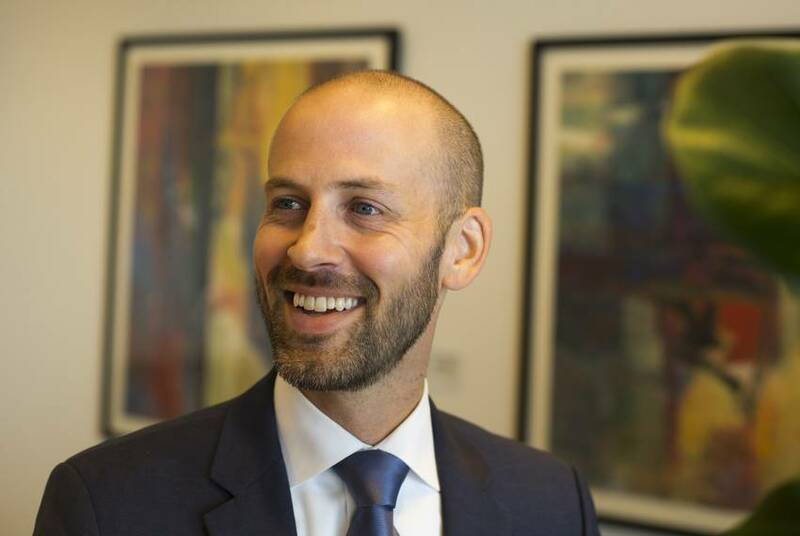 And Keller has been tapped to lead the Supreme Court and constitutional law practice at Baker Botts, one of the country’s leading law firms. “We’re very proud of our alumni,” Keller joked in an interview last week. Someday soon, then, Hawkins might find his own face on a bobblehead. He laughs off the suggestion. The job of the solicitor general is arguing appeals, not first stops at the trial court. But any case that’s set to create a new legal precedent across the country will go up on appeal to influential federal appeals courts or even to the U.S. Supreme Court. Those are the types of legal fights that Texas picks. “It’s created to be an office that the attorney general can direct more resources to the highest-profile cases — the cases that are going to have the biggest precedents, setting the law going forward,” Keller said. When the solicitor general’s office was created in 1999, one of its goals was ramping up Texas’ influence on federal law. 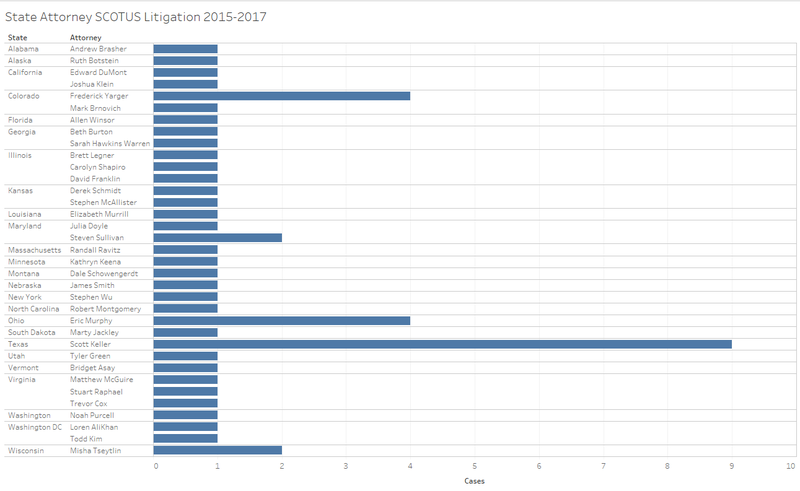 Now, after almost 20 years, the office has nearly doubled the number of full-time lawyers it employs, and it’s in prime fighting shape. Texas’ solicitor general’s office is one of the country’s lead appellate forces, more similar in stature, some appellate attorneys say, to the U.S. Solicitor General’s Office than it is to many states’ equivalents. In just under four years on the job, Keller argued an impressive 11 times before the U.S. Supreme Court. That status, and that work, are unlikely to shift radically with the change at the top of the organizational chart. The lawyers in the solicitor general’s office, who gather most days for lunch around a long wooden table in a 7th floor conference room, have busy dockets ahead. And Hawkins’ role, he said, is to carry forward the longtime priorities of the office. Indeed, the two boast similar resumes, well-stocked with conservative legal bona fides. Both are young — Hawkins commutes to work on a scooter. Neither is from Texas originally. But put them squarely in the “got here as fast as they could” category. After law school, both went on to a coveted clerkship for a federal appeals court judge, and then to the U.S. Supreme Court. Keller clerked for Justice Anthony Kennedy the year he authored the Citizens United decision that shifted campaign finance law for a generation. Hawkins clerked for Justice Samuel Alito the year the conservative justice authored the Hobby Lobby decision, which allowed religious employers to decline to pay for insurance coverage of workers’ contraception. Working for Alito was “a dream come true,” Hawkins said. That experience — which a handful of staffers said has become an unwritten requirement for the top job in the solicitor general’s office — positions Hawkins well to defend Texas in the nation’s highest court. If history is any guide, he’ll have many opportunities. Hawkin’s current boss, Attorney General Ken Paxton, didn’t change that approach so much as ramp it up when he took over in 2015. Abbott sued the Obama administration 31 times in six years. Since taking office, Paxton has launched or waded into 29 lawsuits against the federal government, according to agency records. “We never turned away from a righteous fight,” Paxton said of the legal onslaught at the Texas GOP convention in June. Texas doesn't always get to choose its legal battles; the state has been sued several times, for example, over voting rights issues. One of Keller's biggest losses came in 2016, when the Supreme Court struck down two state abortion restrictions. But other legal fights — often the highest-profile cases — are the cases Texas started. One of Keller’s biggest victories as solicitor general falls into that category. His arguments against the Deferred Action for Parents of Americans and Lawful Permanent Residents program — an Obama-era initiative billed as an expansion of DACA — left a then-eight-member Supreme Court deadlocked, and the program never went into effect. A substantial group of those lawsuits take aim at federal environmental regulations. Texas and its allies say those cases target federal overreach from unpopular and unelected agency bureaucrats. Skeptics say the state wants to reverse any rule that would disadvantage oil and gas billionaires. Whatever the motivation, the state’s premier appellate task force often gets results. Texas helped lead the lawsuit that blocked the Clean Power Plan, a signature Obama-era environmental regulation, from going into effect. Just last week, the state won a preliminary injunction blocking the Waters of the United States rule, another Obama-era measure aimed at limiting pollution. The cases that progress beyond trial courts — often the most important ones — all fall into the hands of the solicitor general and his staff. 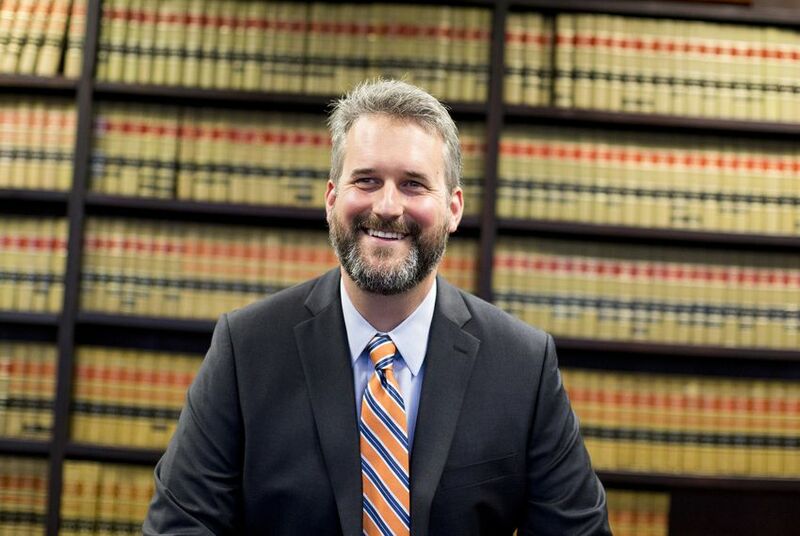 Chad Dunn, a prominent voting rights lawyer who said he has fought every Texas solicitor general since Ted Cruz in the mid-2000s, praised Keller as well-prepared and personable. But he said his office has tremendous influence — and not in a good way. This year, Texas’ legal muscle is fighting to undo perhaps the two most enduring pieces of Barack Obama’s legacy: the Affordable Care Act and the Deferred Action for Childhood Arrivals program. Those lawsuits, if successful, would risk the health insurance of millions of people and the legal status of hundreds of thousands of immigrants brought to the U.S. as children. Texas has called both measures unlawful. Critics say the state’s challenges are motivated by politics, not genuine constitutional concerns. Keller has been involved in both cases since their early stages, he said. It makes sense to have an appellate attorney looking ahead to long-term strategy, current and former office staffers said. Now, that work falls to Hawkins. Cruz, and a row of other conservative guides, will be bobbing along behind him.